Soak up the 360-degree views on the rooftop of this CBD pub. Located at the top end of Melbourne's CBD, the Imperial Hotel offers some of the best city views from its lofty rooftop. It has been around for a while — a sports bar and pub just across the road from Parliament House — but recently launched its rooftop in 2015. The rooftop, with stunning 360-views of the city, can fit 270 punters and serves up 20 beers on tap. And while summer is long gone, the pub is keeping things cosy with its boozy winter rooftop garden. 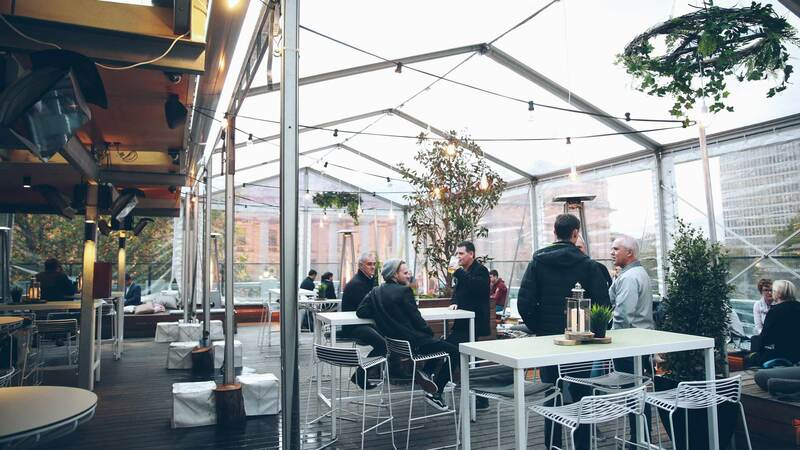 Inspired by the rolling highlands, with comfy blankets, wooden furniture and back country greenery, the massive transparent rooftop marquee — equipped with a dozen new heaters — will keep the great city views without the winter chill. Keeping things toasty is a boozy cocktail selection offering an assortment of delicious winter-themed drinks and a special build-your-own hot chocolate menu. Create your own concoction, starting with a base of either Kahlúa, Baileys, red wine or choc-mint mezcal. Then, top it off with your choice of marshmallows, crushed nuts, choc mint, grated chocolate or chocolate syrup. Once you've got drinks sorted, dive into the winter food menu which includes a warm antipasto platter, loaded fries and a range of cob loaf dibs — think gooey camembert and mixed herb, lamb and rosemary or chilli pulled pork. Gazing out over Treasury Gardens, Parliament House and the city skyline, with a boozy hot chocolate in hand seems like the perfect winter choice.